Add our Amish Heritage Mission Cedar Lined Chest to your bedroom for added storage at the foot of your bed that you can utilize for many years! 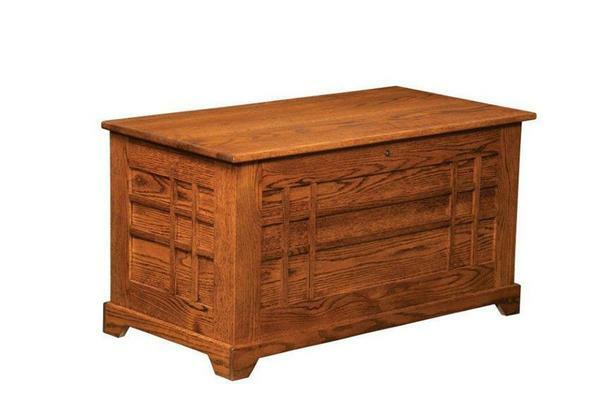 This beautiful solid wood hope chest comes standard with one lock and soft close hinges for easy opening and closing. The full cedar lining inside of this chest will add an aromatic cedar scent to your bedroom and protect clothes and linens from moths. Call one of our Amish Furniture Specialists today at 866-272-6773 if you would like more information or if you have any questions about this Amish hope chest. Thank you for choosing DutchCrafters for all of your Amish bedroom furniture needs.